Ellie and I start our walks by heading to the nearby dog park, passing one of her greatest admirers on the way, sweet little Yum Yum. As a young pup she’d pretend she had to go to the bathroom so she would get let out and could come running to say hello as we passed. 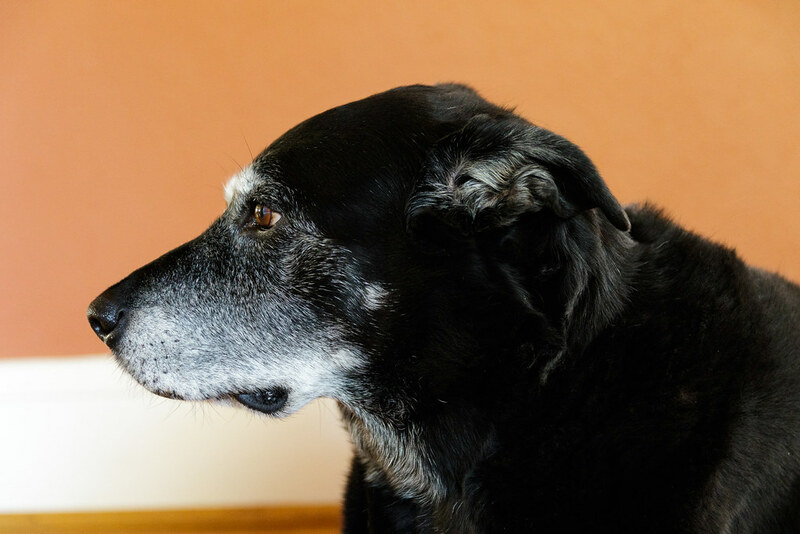 These days we often see her up on her porch, tail wagging furiously, a gate blocking her escape. She must know the jingle of Ellie’s dog tags as she walks as Yum comes out to greet us whenever we approach. If she’s out in the yard I’ll walk Ellie over to see her before crossing the street, she’s always so excited to see us. Yet for all that Ellie has perhaps an even bigger admirer that lives nearby, a young dog named Noki that gets overjoyed whenever he sees Ellie and can’t stop licking her in the face. Apparently he doesn’t do it to other dogs and we’re not sure what it is about Ellie that delights him so. One time we met him out walking instead of in the dog park, he was in a harness but he was straining so hard to come and meet us that he busted the snaps on his restraints and broke free. She has other young admirers but none quite so worshipful as these two. She has human fans as well, she’s an easy dog to love, someone came up to us in the dog park recently and commented on how much she loved the relationship I have with her. She’s been with us for over seven years now so our bond is pretty strong. A few days later while we were out in the neighborhood someone came up and said how happy it makes him every time he sees us. I try to spend the time on our walks in the moment with her, to forget all the pressures and stresses of the regular world and find joy in our time together. I love the quick little glances she gives me from time to time, I know she’s just checking in to see if it’s OK if she lingers a little longer near an interesting smell or if we can head down the next street, but it feels like she’s saying “thanks for being my buddy”. Her face is more gray than black these days but she remains, as always, my great delight. 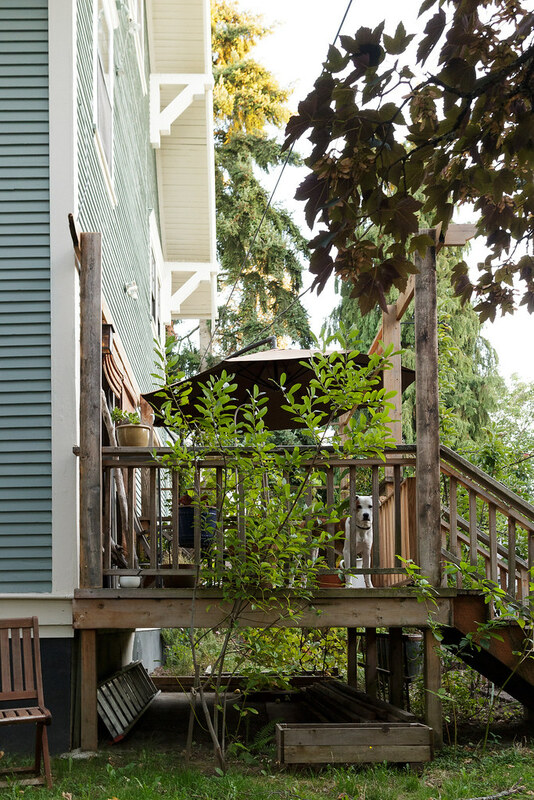 Portland is known as the City of Roses and decades ago a prior owner planted a bunch of roses in our backyard. I’ve always been a bit torn as to whether or not I should keep them. I’m not a huge fan of roses themselves, although we have one variety in particular that I think creates a lovely flower. Some of them aren’t doing so well, but even those that are thriving often get leaves covered in black spots, a consequence of a fungus that thrives in our climate. There’s a natural pesticide that can keep it under control but when possible I prefer to not use pesticides. 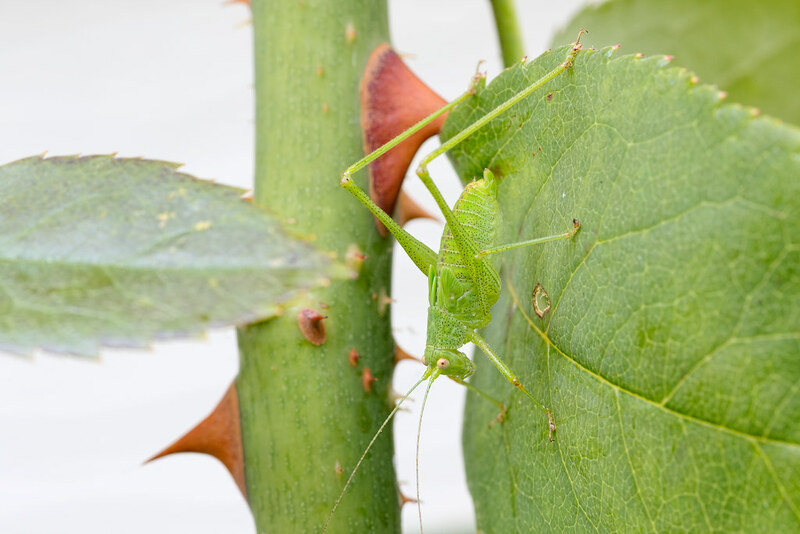 My favorite thing about the roses is the katydids that sometimes live there in the summer, in July we had a handful in one spot, from fairly young nymphs to an adult. The nymphs go through several stages, this female is easily recognizable as a katydid but she is only starting to grow her wings. When full grown they’ll stretch down the length of her body (as you can see on this adult female from last year). When I see one on a bush, I leave nearby spent flowers a little longer than normal so that my friends will have plenty to eat. 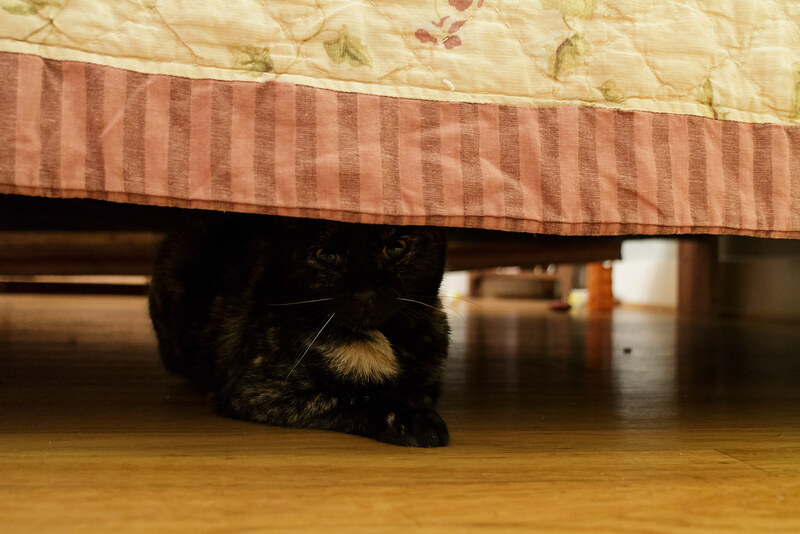 I took this picture of Trixie hiding under the bed on her first day with us in January of 2015, she was home but it did not yet feel like home to her. 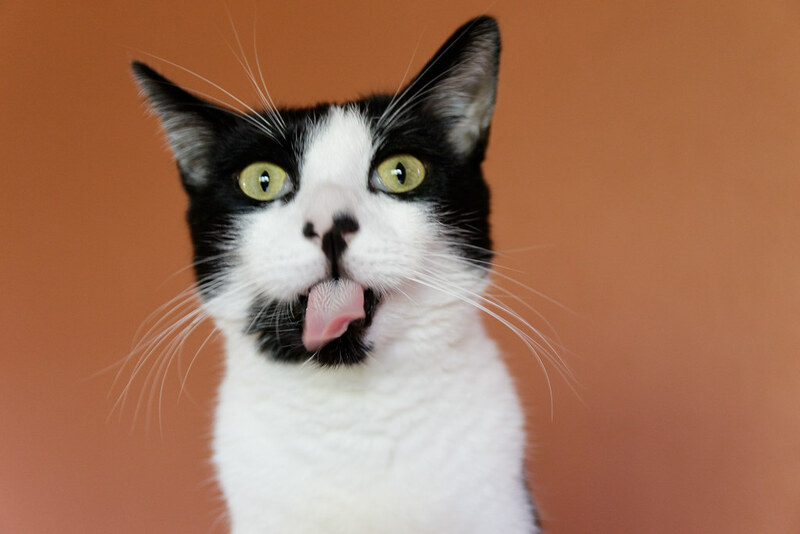 It had been quite a month for her, she was rescued on New Year’s Day on the other side of the state and brought to the Oregon Humane Society here in Portland two weeks later. They kept her for two more weeks until she was spayed and we brought her home on the 27th. It wouldn’t take her long to realize she was home though, soon she was out from under the bed and snuggling with me on top of it. She’s never looked back. I used my little mirrorless camera for these first shots to avoid stressing her any further, it’s far quieter and less obtrusive than my larger camera. I was surprised to find how relaxing both of my short hiking trips were earlier this year as it normally takes me a bit longer to decompress from work before I can begin truly enjoying my time off. Perhaps it was partly because my most stressful project had finished. Partly because both destinations were within six hours of the house and thus didn’t require a lot of driving. But I also had a lot of fun each day, each with its unique charms, such as going out to the beach at Lagoon Creek in Redwood National Park and finding a lair of lined shore crabs. While lair may not be accurate, this one does look like it’s guarding its lair with emptied barnacle shells and shadows behind it. 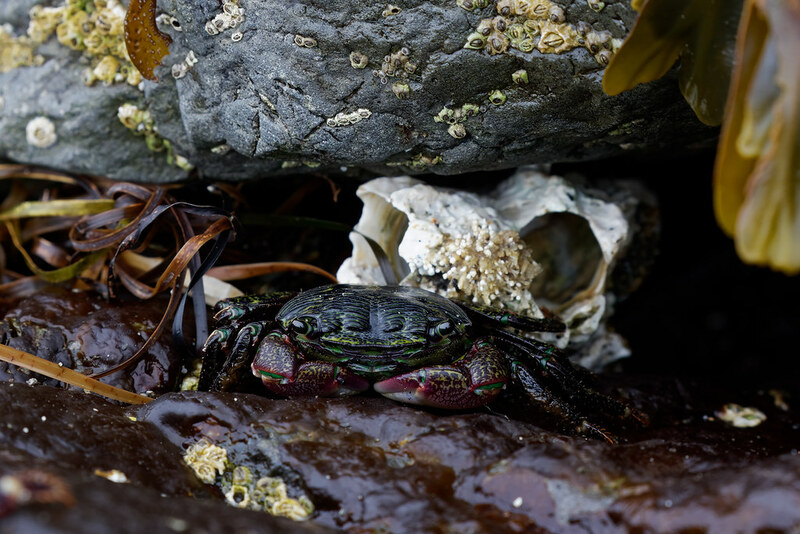 There were a handful of crabs in this one little still-damp spot in the tide pools, the water not far off, and watching them and some nearby oystercatchers made for a delightful time on my spur-of-the-moment hike on the Yurok Loop Trail, my first visit to this section of the park.